John Thomas "Tommy" Rudford’s purchased the restaurant in 1949 and did everything right in attracting patrons from all walks of life and age groups, as well as retaining the same waitresses, staff and cooks for many years. Rudford's prosperity was due to old fashioned home-cooked food prepared from scratch on a 24-hour basis. They served breakfast all day and night. The waitresses knew their customers and cared about them enough to visit them when they were ill. They even took them flowers when they were in the hospital. Customer birthdays were celebrated with a lighted candle in a doughnut on their special day. Many patrons of the restaurant met there, married and continued to be a major part of the restaurant's home spun flavor. The early morning crowd included utility crews, blue and white-collar workers, newspaper route managers and people who worked in the area. The lunch crowd was similar, but the dinner groups included families with children. More interesting people came about 2:00 AM after drinking a little too much. The waitresses made quick work of those who disrupted their tranquility by chasing off the offenders. They also chased after those who tried to get away without paying their bill. Tommy Rudford was active in many civic and fraternal groups such as the Scottish Rite Temple, AL Bahr Shrine, Fraternal Order of Eagles and several San Diego clubs. He ran for mayor in 1949 but was defeated. Mr. Rudford passed away in 1972. His daughters continued to run the business until 1983. Leon Gilman bought Rudford's in 1983 and quickly drew media attention by firing all of the employees because he did not want a union. Some of the employees picketed and he rehired about half of them. Rudford's is presently owned by Jeff Kacha. The restaurant continues to enjoy a wide and diverse clientele by continuing to provide the home cooked dining faire that has always made this North Park restaurant a popular gathering place for the local residents as well as patrons from throughout San Diego. 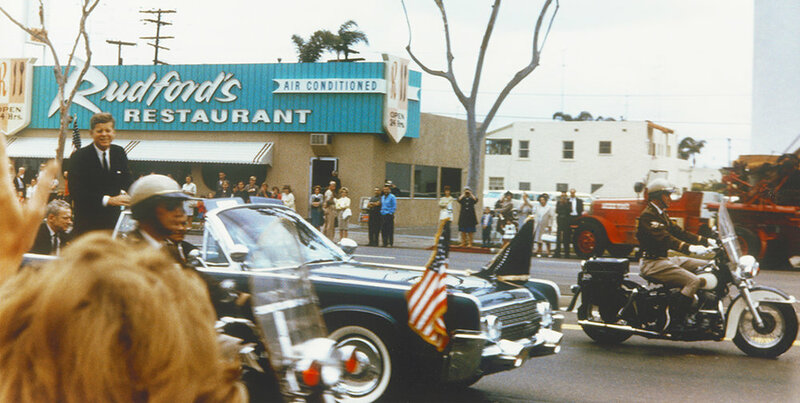 For over 70 years, Rudford’s has been providing San Diegan's with exceptional and traditional diner favorites. The retro atmosphere attracts all ages. Customers come to Rudford’s Restaurant to relive the good old days and enjoy home-style favorites. The nostalgic décor and past time memories are what makes Rudford’s a true American icon, it’s home away from home.